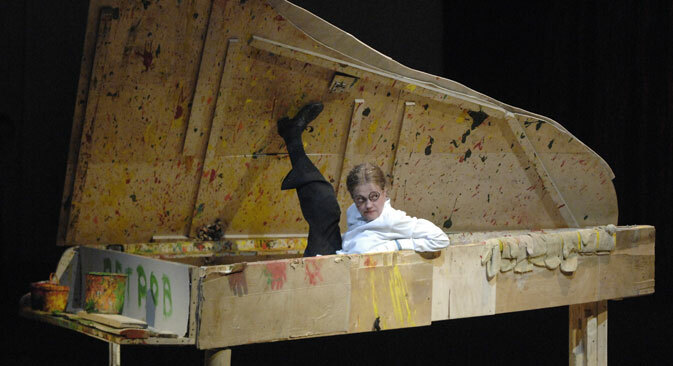 Krymov’s production of Opus No.7 was already shown in Britain at the Norfolk & Norwich Festival in early May, and it will play at two more festivals in June. The work is divided into two acts: the first about the tragedy of world Jewry and the second about the fate of the composer Dmitry Shostakovich, who lived during the Stalin era. In 1948, the country’s main party newspaper, Pravda, ran an unsigned article titled “Muddle Instead of Music.” The article harshly criticised Shostakovich’s opera “Lady Macbeth of Mtsensk”, calling it “antinational.” This was the beginning of state harassment of the composer. His works were banned from being performed, and he could have been arrested at any moment. It might be asked what unites a world-class composer and the “little people” from the first half of the work? But harassment of a genius and government-sanctioned anti-Semitism are two sides of the same coin, two manifestations of totalitarian power. Opus No.7 is something between a show and a visual performance. There is no plot as such: there is video art, photographs of victims, mannequins, dolls and even ordinary rubbish. The director’s message is transmitted through visual images. This approach has a back story. In the 1980s, Krymov was working as an artist on the productions of his father, the renowned director Anatoly Efros, and in the major political theatre of the time, the Taganka. In the 1990s, he dedicated himself to painting, and now, having returned to the theatre as a director, he continues to teach theatre artists at the Russian Academy of Theatre Arts. His current shows are so packed with metaphors that they occasionally call to mind a rebus. A certain preparation is required to solve it. “Of course, the British don’t know the nuances of Russian history, but they are very open and they express their feelings even better than Moscow audiences. Because of this emotional keenness, I have gotten the sense that the British have done an excellent job of understanding our shows,” Krymov told RBTH after the performances at the Brighton and Norfolk & Norwich festivals. Krymov consciously deviates from literature-centric theatre. “I want to make theatre that affects the audience with another method. A literal utterance by an actor of some text written by someone tends to weigh on me,” he said. Nevertheless, in 2012, Krymov mounted his show “As You Like It”, based on Shakespeare’s play “A Midsummer Night’s Dream”; it premiered in Shakespeare’s birthplace, Stratford-upon-Avon, as part of an international Shakespeare festival. That same year, the production won the Scotland Herald Angel award at the Edinburgh International Festival. This autumn, it will be shown in London, at the Barbican Centre. Krymov has departed from a straightforward treatment of the play. He said that at the heart of the production is the work’s finale, when the mechanicals show Herzog their show. The only thing remaining from the original idea is the plot. Krymov created everything else in his visually eccentric style. For example, a group of workers pulls a log, along which a dog is running; a fountain is dragged onstage and threatens to drench the spectators in the front rows. In addition, there is a succession of marvelous side shows. Read more about Opus No.7 on The Kompass, special RBTH section for all UK-Russian cultural events.